Awe is a powerful emotion that can make people feel more generous, creative, helpful and connected to something bigger than themselves. Monday’s solar eclipse is expected to deliver a big dose of the emotion. Thirty-eight years have passed since the last total solar eclipse in the Pacific Northwest, but Bruce Haley’s memories haven’t dimmed. From the Rattlesnake Hills above Yakima, the Seattle man watched with wonder on the morning of Feb. 26, 1979, as the moon’s shadow raced across the landscape below. “So many fantastic things happened all at once,” Haley recalled. A cone of darkness engulfed the hilltop. The sky opened up like a tunnel with stars glittering at the end. The solar corona burst into view like a wreath of curling flames. Insects fell silent. Psychologist Dacher Keltner, of the University of California, Berkeley, has been collecting stories of awe experiences from around the world. 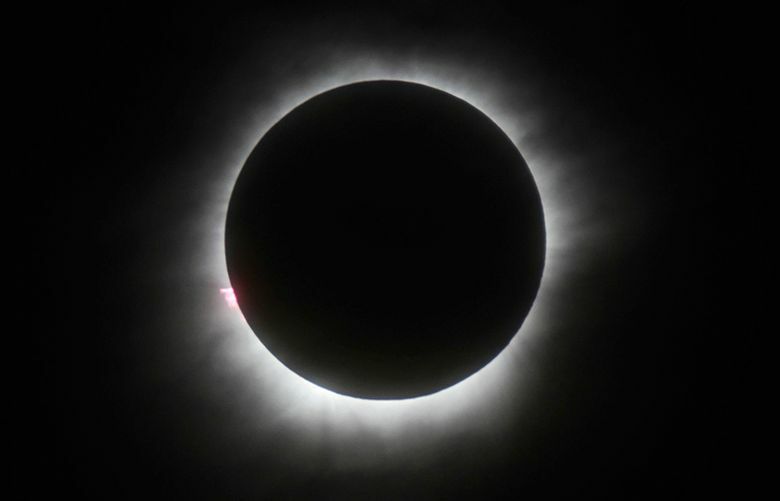 If you’d like to share your experience of Monday’s total solar eclipse, write it up and send it to keltner@berkeley.edu or mariamonroy@berkeley.edu. Haley’s experience fits the classic definition of awe: the jaw-dropping emotion brought on by events and encounters so extraordinary that the mind struggles to make sense of them. “Awe is a pretty powerful emotion,” said Dacher Keltner, the University of California, Berkeley psychologist who co-authored the first scientific paper defining awe, and who remains a leader in the fledgling field of study. Though often fleeting, awe can also be very good for us, he and other researchers are discovering. An experience like a total eclipse of the sun can leave people feeling less stressed, more generous and more humble. By focusing our attention outward, awe diminishes our sense of self and boosts feelings of connection to others and the wider world, Keltner said. Some scientists think it might even be possible to harness awe and its mind-blowing effects to help people break bad habits and thought patterns and improve well-being. Neurological studies are beginning to tease out awe’s impact on the mind and body. At the same time, it’s becoming clear that it doesn’t require a cosmic convergence like Monday’s solar eclipse spanning the nation to bring on bursts of the emotion — which is good news for those who would like a little more awe in their lives. When Keltner and his colleague Jonathan Haidt set out in 2003 to define awe and distinguish it from other emotions, they found scant research on the subject. That’s partly because awe smacks of religion and spirituality, which weren’t seen as the province of scientists, Keltner said. It takes two ingredients to invoke awe, said psychologist Michelle Shiota, of Arizona State University: an encounter with something that’s extraordinary and that also upends our assumptions about the way the world works. When she first visited the Grand Canyon, Shiota thought she knew what to expect. She’d seen photos, and wondered whether it was worth going out of her way. Then she stood awe-struck on the rim. It’s like the difference between understanding how an eclipse happens and watching it unfold before your eyes. “A part of your brain is going: That’s not supposed to happen,” she said. In the lab, scientists invoke awe by showing their subjects stirring vistas, nature videos or photos of natural wonders. They also ask people to recall their own experiences of awe. After experiencing awe, people report feeling more compassionate, generous and helpful than those who experienced other emotional states. In one experiment, people who gazed up at 200-foot-tall Tasmanian eucalyptus trees felt more ethical and less entitled than people who looked at a tall building. Another study found awe made people feel like they had more time. A study to be published soon found veterans and urban high-school students who participated in whitewater rafting and other awe-inspiring activities enjoyed an enhanced sense of social well-being and fewer PTSD symptoms for weeks afterward, Keltner said. Awe seems to jolt people out of their mental ruts and open their minds to new information and insights, which is why Shiota thinks it might be useful for therapy. “If it creates this period of malleability … perhaps we can use that to help people promote healthier behavior,” she said. Shiota and her colleagues found that awe boosted subjects’ ability to recall details of a story, while reducing the tendency to insert false memories based on preconceived notions. And people who had recently experienced awe were better at critical thinking. “We think that what awe does is push us toward experiencing the world as it is and letting it shape our minds, rather than allowing our minds to shape our experience of what’s out there in the world,” she said. Awe also seems to quiet the brain’s fight-or-flight pathways, making people pause and absorb what’s in front of them. Keltner and his colleagues found awe activates the vagus nerve, a major conduit that lowers stress, blood pressure and inflammation. Awe also tamped down concentrations of inflammatory molecules in the blood. The feeling of transcendence — the vanishing self — that accompanies awe appears to have a physical basis, too. It’s no surprise that peering at the Grand Tetons or the Milky Way can make people feel small. But researchers have actually quantified the effect, reporting that people sign their names smaller and underestimate their own body size after awesome experiences. Dr. Andrew Newberg, a neuroscientist at Thomas Jefferson University who pioneered the study of religion and the brain, used functional MRI and other methods to scan the brains of praying nuns and Buddhist monks deep in meditation, states that closely parallel awe. He found strong activity in the limbic system, which is related to emotion and memory, and a quieting of the parietal lobe, which establishes a sense of self and spatial position. The results are vivid memories and a blurring of the boundary between the self and the rest of the world. Psilocybin mushrooms and LSD have similar effects, creating what Keltner calls a “purified version of awe.” Researchers at Johns Hopkins University found that many subjects who experienced a single psilocybin trip described it as one of the most “spiritually significant” events in their lives and still felt a greater sense of well-being more than a year later. In its natural form, awe — like all emotions — must have evolutionary roots. Keltner suspects the emotion helps people overcome their selfish instincts and focus on the well-being of their social group. “Awe really unites people,” he said. Most people will feel the transient glow of awe, Newberg said, but only a small fraction will be moved in deeper ways. If one taste of awe creates a hunger for more, though, you don’t have to wait for another eclipse. In studies around the world, many people say they experience awe a couple of times a week, Keltner said. The trick is to figure out what will work for you. Haley is heading to Oregon for another shot of eclipse magic. With throngs of people converging on the zone of totality and massive traffic jams likely, he doesn’t expect the experience to be as spectacular as 1979 — but it doesn’t have to be. “I’m hoping for something half as good,” he said.